La vie Jaime : Saturday North End Stroll & Giveaway! Saturday North End Stroll & Giveaway! Saturday was a perfect, crisp day for running errands around the city. I particularly needed to stop by Injeanius in the North End to spend my Rue La La voucher ($50 for $100, thank you!). I wore my new Ruana scarf, gifted from Top it Off, a new accessories pop-up shop in nearby West Roxbury. There are tons of ways to wear the scarf, but I chose a wrap & belted style, layered with another pashmina scarf of mine for extra warmth. 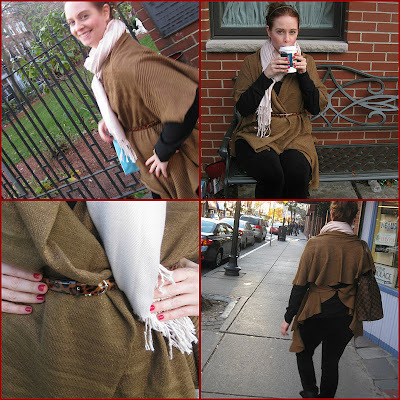 It was a comfy, easy look for walking, shopping, and enjoying a Cafe Vittoria latte! Top it Off also sent me two additional Ruana scarfs to giveaway to two readers of La vie...J'aime! All you have to do is visit Top it Off (and see all the cute accessories- great gift ideas! ), and comment here of which color you'd like to win: gold or silver. I'll announce the two winners on Thursday. Check out these photos of a few ways to wear this versatile scarf. PS: If you are in the Boston area, visit Top it Off til December 30 at 162 Spring Street, West Roxbury. Go quick! Next time you are in the North End, def visit me at LIT. Great outfit for this past Saturday! Scarves are the best gifts. Just got my mother one! North End strolling - what could be better! I'd love to win the scarf - I'm thinking the gold one!! Love the gold one. I have been leaning towards gold/brown tones lately. I love the gold scarf! Soft & ruffly & neutral. Oh how pretty! Great giveaway! I wear a lot of brown, so I'd love the gold one! Thanks for hosting! I really love the gold one!! I love both! I love how you belted it to wear almost more like a shirt than a scarf!! gold! and you look so cute in your pics! scarf is the best accessory. Oooh I definitely will check out their shop - I never head to West Roxbury because I am unfamiliar with that location. I love the gold one! Thanks for taking the time to visit my blog and for your sweet comments, much appreciated! ohhhh, i love those scarves! my fav is totally the gold! Looking forward to Thursday result! Oh this is really tough but I would go with the gold. Looks better with black and I have somuch gray! Love that scarf in both colors, it can be worn so many ways! I'll have to check out that store for sure- thanks for introducing it!